Welcome to another fun and amazing kitchen segment here on WakeUpNigeria. We”re bringing you this special recipe from Chef Ofe Fadeyi of ‘CerisepinkOccasions’. 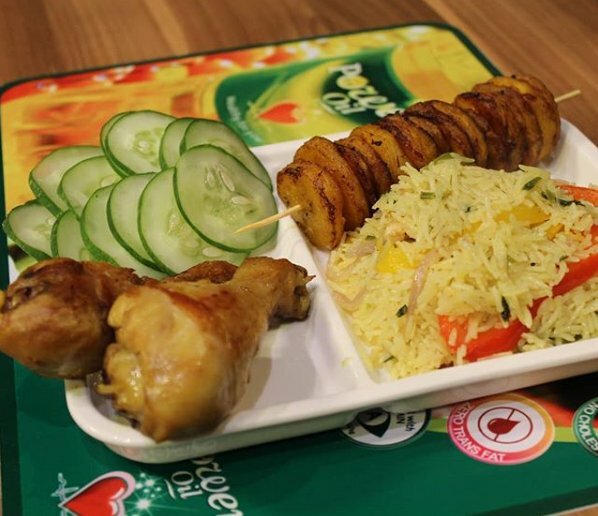 Breakfast for the day is ‘Stir Fry Basmati Rice served with Drumsticks and Skewered Plantain’. Sounds a little too much? Don’t worry about it all this quick and easy recipe got you covered thanks to WakeUpNigeria. We bring you the best as always and in no time you can enjoy every bite of your meal. Follow the cooking directions below. Parboil your basmati rice according to package directions. In a non stick pan, pour in little vegetable oil. Then add your shredded chicken and allow to fry on low heat. Take out the used oil and pour in fresh vegetable oil. Saute onions, spring onions and garlic to the oil for about 5 minutes. Add your seasoning and sauce to taste. Cook until the vegetables are crisp tender. Then pour in your rice and stir well to combine. Allow to simmer for about a minute. Serve immediately with your skewered plantain and grilled Drumsticks.